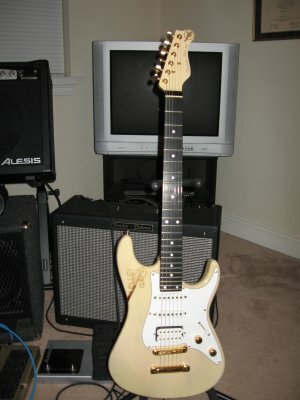 blonde, 7/8, ebony fret board, alder body, gold Valley Arts tuners, stop tail piece, white Pickups -seymour duncan? (no markings), no mods that I am aware of, nice strat Carlton sound. I purchased the guitar used.